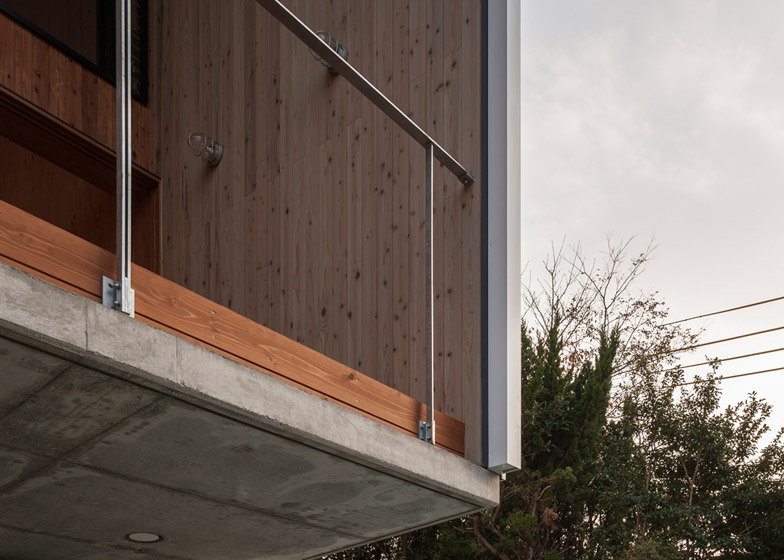 This timber-framed house by architect Tatsuyuki Takagi is raised up by a cantilevered concrete slab, keeping it away from a busy road in Toyohashi, Japan (+ slideshow). 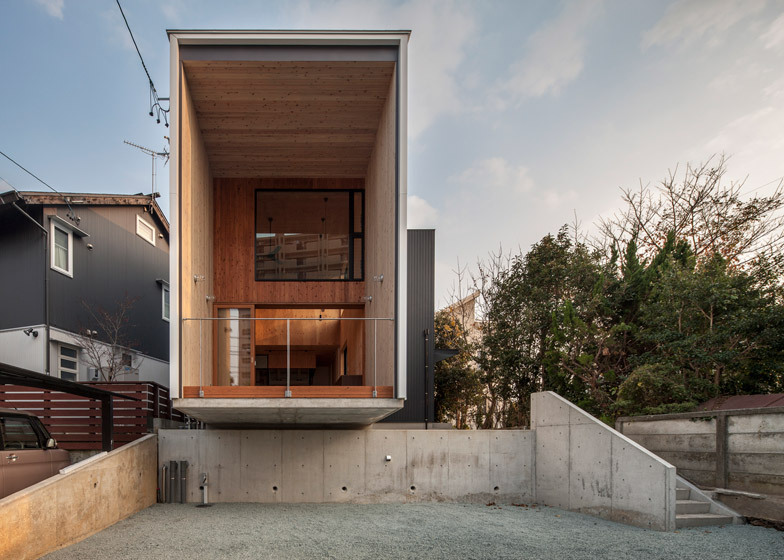 The cantilevered volume provides a two-storey-tall living space for the family home called Fly Out, which was designed by the Tokyo-based architect for a couple and their young child. The building faces a busy road in Toyohashi, a city in Japan's Aichi Prefecture. 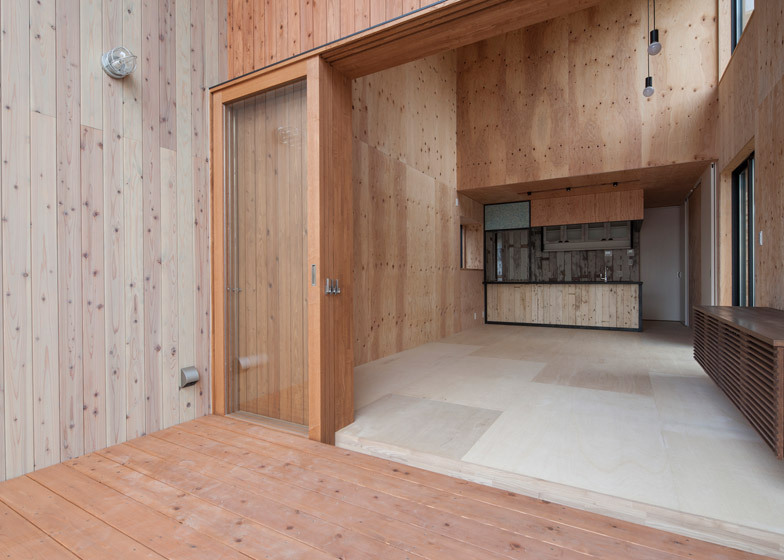 The awkward piece of land was selected specifically for the project by the couple, who asked Takagi to come up with a design for a house before they bought the land. Their brief was for a low-budget building that would marry together their desire for a large open-plan living area, but also allow ample parking space for the husband's car collection. 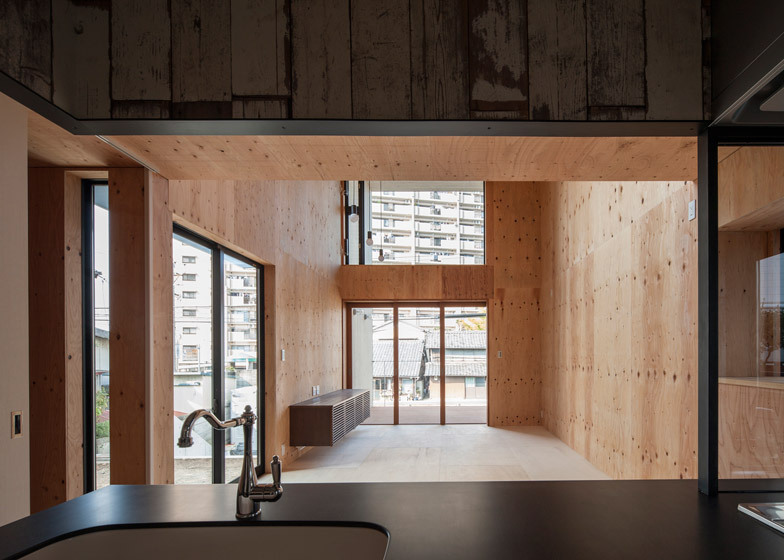 "To leave most of the budget for the living area, this project began by proposing a blueprint which will provide enough parking space and create comfortable space by taking an advantage of the less valued sloping land," Takagi told Dezeen. 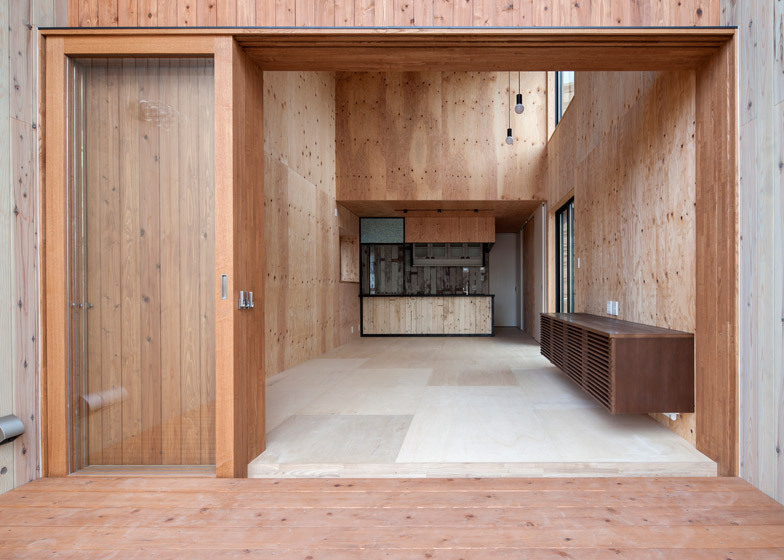 "Generally speaking, clients in Japan will ask for a blueprint after land has been purchased," he added. "However in this case the client came to us before the purchase, so it became our target to bring the most effective cost between which sort of land to purchase and the design to be built on top." The cantilevering volume is set above ground level to avoid direct views of passing traffic, instead framing views of housing on the opposite side of the road. 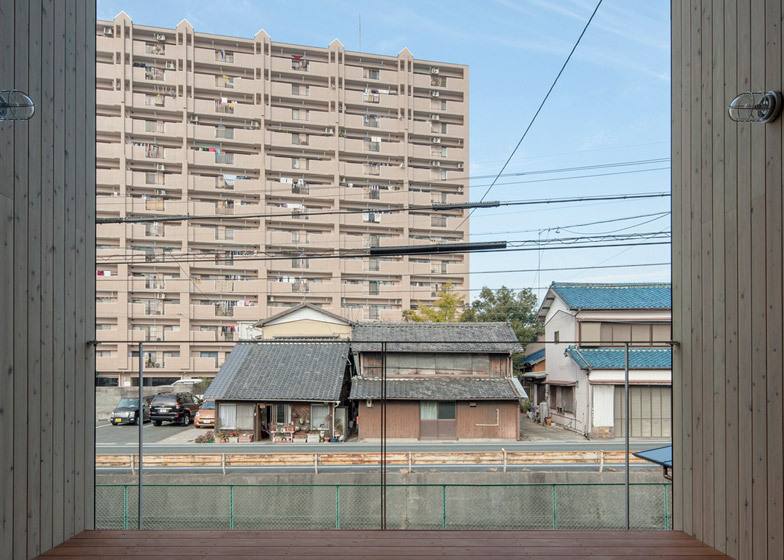 A deep balcony was also added to the front of the tall living space to act as a buffer zone between the hubbub of the street and the primary living areas, allowing bedrooms to be tucked away in the more secluded area at the rear. Large expanses of glass front the double-height living space, which is lined in plywood and clad in strips of Galvalume – a type of steel sheeting with a protective zinc and aluminium alloy coating. 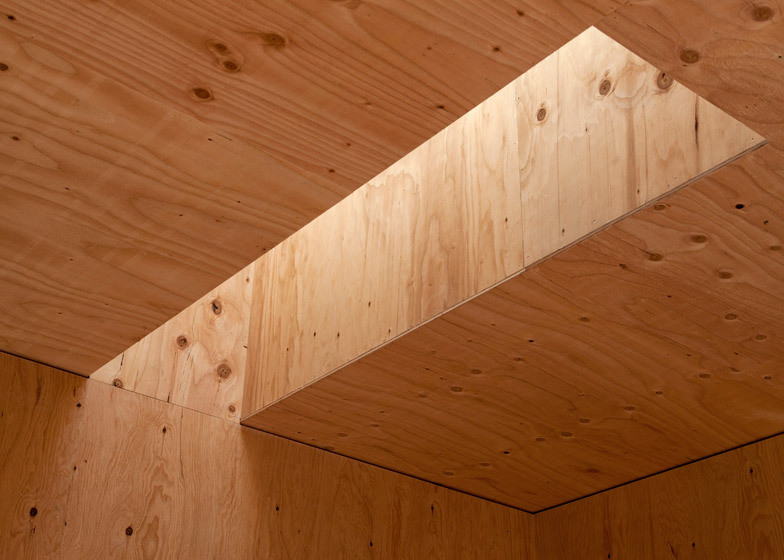 This metal and wood sleeve extends around the balcony at the open end of the cantilever. Beneath it, the gravelled parking lot has enough space for the couple's three cars. 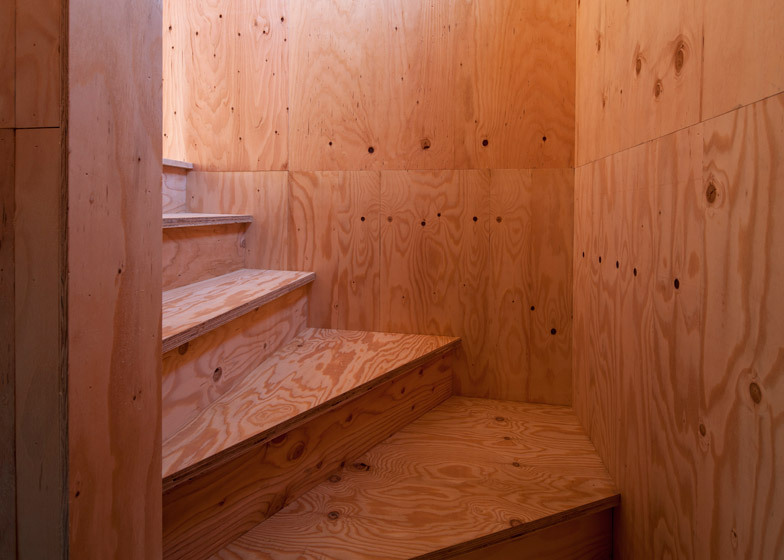 At the rear of the house, a plywood staircase leads to the bedrooms and bathrooms, where windows are directed towards several trees. 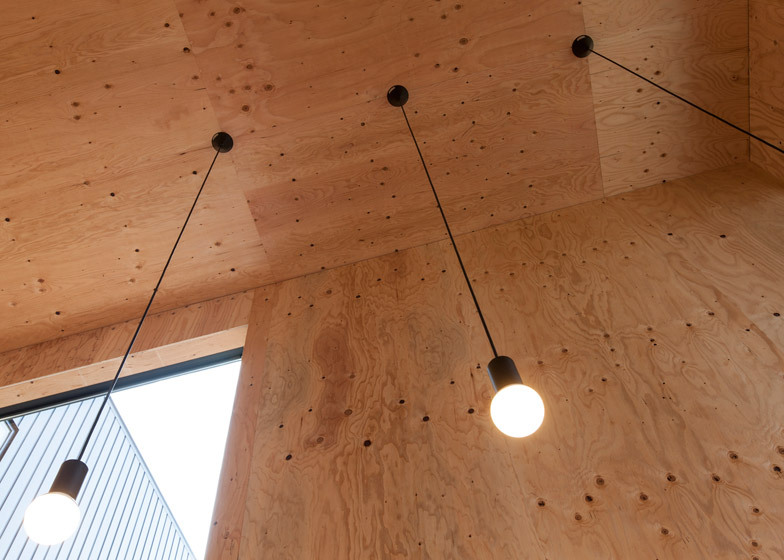 "This space has won harmony with the openness and the surrounding environment," added the architect. 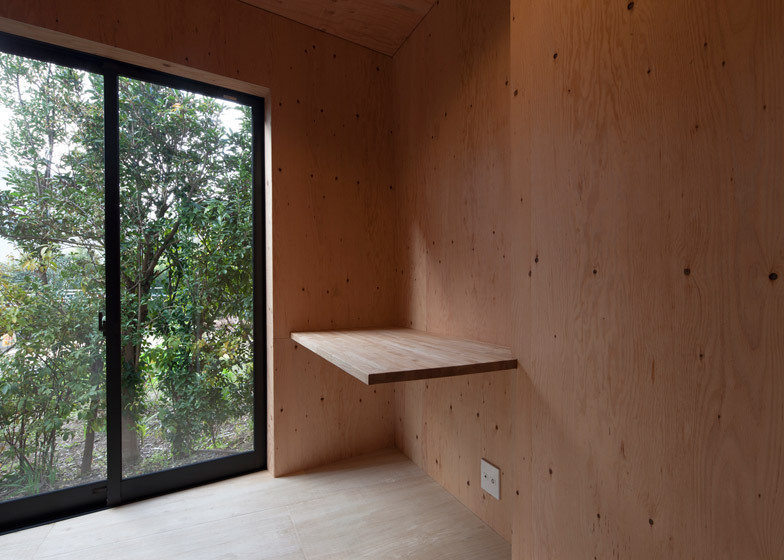 "It's low cost, but realised an impressive space." Japan's commuter roads have given rise to a number of innovative projects that aim to create a buffer from traffic. Others include an office with an armoured facade and a cafe that reflects an avenue of cherry trees in its mirrored gables. Photography is by Satoshi Asakawa.